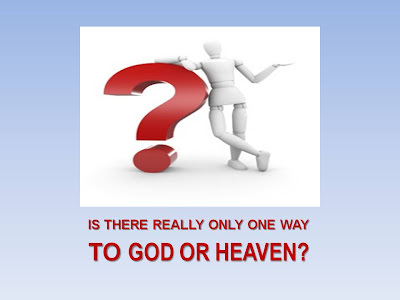 IS THERE REALLY ONLY ONE WAY TO GOD? To answer such questions according to the New Testament is to risk being labeled a bigot or at best, narrow-minded; which happens to not be completely untrue, because as followers of Jesus, we are to be narrow way minded. Several questions were asked in our Quest for Tough Questions that all boiled down to this one question; determined by our Survey to be #3. Other questions asked included: “Is ‘once saved always saved’ the truth or “once saved always changing” the truth? Questions like this have been argued about for centuries, with one side saying, “Yes” and the other resounding, “No” with both quoting verses to prove their points. This question has often been asked by us because of a lack of knowledge on our part, to which the Bible - as usual - has much for us to learn. Addressing this subject Biblically is only difficult - in this short effort - because of the abundance of things that the New Testament has to say about it. In this age of “itching ears” and popularity contests the truth must be told here without any fear or intimidation. What does the Bible have to say about a question like this one? Recently, I conducted an informal survey of over 500 Email and Facebook Contacts, asking them what they thought were the most important questions people are asking today about God, Christianity, the Bible and life in general. In fact, 73% of these participants think this question is very important and 21% think of it as important, while only 6% think it is unimportant.